There's a Privacy Battle Going On You Can't Afford to Lose. Privacy has to be one of the biggest concerns for everyone who goes online. As you know, it's getting harder to keep the advertisers or outsiders of our private business and personal affairs, with government spying, ad tracking and so on. 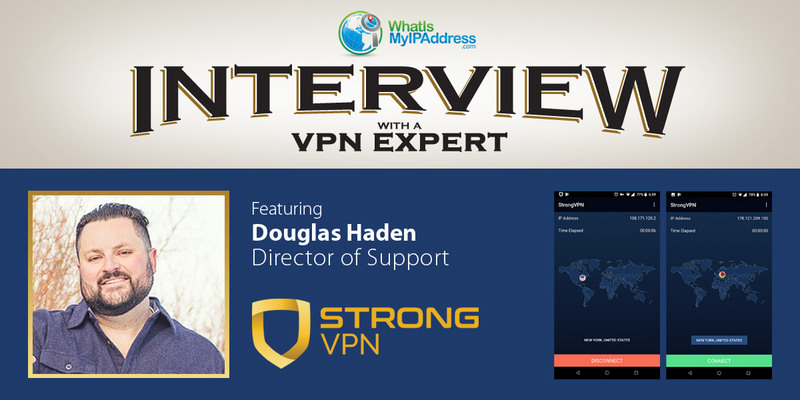 I talked to Doug Haden of StrongVPN and he provides some great advice on what we can do (should do) to stay safer online. "We began as a small company in South Lake Tahoe. Our secure servers, our no-logging policy, or our encrypted, and high-speed connections help to ensure privacy for all. As one of the only zero-logging VPNs that's been around for over a decade, we're committed to making sure our story is reflected in the quality of our service." CHRIS: What is the single compelling reason you feel someone should be using a VPN? DOUG: If you want to keep your online data private, using a VPN is absolutely essential. By encrypting your traffic, VPNs allow you to stay secure and anonymous online on any network. StrongVPN can help keep your search and browsing history hidden from the eyes of Google, Facebook, your ISP, and other large corporations, who are known to keep records of user data. CHRIS: What are the top three objections people give to getting a VPN? DOUG: I often hear the following: "VPNs make your connection too slow." While this is true for some VPNs, StrongVPN offers lightning-fast connections speeds because of our optimized network. We aim to deliver speeds as close to your normal connection as possible. I also hear this, "VPNs don't work with a certain service I want to access." Here at StrongVPN, we go out of our way to ensure compatibility. If a customer wants to use our VPN for a specific device or service, we'll do everything we can to meet their needs. Another objection I hear is, "My ISP doesn't care what I'm doing." Despite what many think, your online activity is inevitably stored by your ISP. Your ISP can easily track any site you visit, and can read anything you send that's not encrypted. Your ISP can easily track any site you visit, and can read anything you send that's not encrypted. CHRIS: Are there special uses of a VPN that are untapped that we should know about? DOUG: Being able to purchase products and services that might not be available in your home country. Another important use for a VPN is travel. Not only will a VPN keep your connection safe while you use public Wi-Fi in airports and hotels, but it will allow you to access content from your home country. This is an added perk of changing your IP address, giving you access to content from anywhere in the world simply connecting to a server in a country of your choice. CHRIS: In addition to using a VPN, what three services or products should everyone use to help ensure their online privacy and safety? DOUG: I have three main suggestions. First, we recommend using private incognito browsers, especially while browsing at work or school. Chrome offers a useful incognito mode, and other websites such as DuckDuckGo, Search Encrypt, and Start Page are anonymous search tools that keep your search history virtually invisible. Second, because no one likes seeing those pesky targeted ads, so using an ad-blocker is key when it comes to maintaining privacy online. AdBlock, AdBlocker, AdAway, and Brave Browser are just a few examples of helpful ad-blocking tools available for your browser of choice. Finally, using an encrypted email service is another great tip. ProtonMail, Tutanota, and Hushmail are all solid private email providers that will keep your email messaging under wraps at all times. CHRIS: What three online habits or personal disciplines should people develop to help ensure their privacy and safety? Be sure to practice better password habits. This means never using the same password for more than one account or device, and always use long, complicated passwords that would be hard for a hacker to guess. We also recommend using a password manager to securely store your various passwords. Also, be aware of phishing scams. Get into the habit of questioning any kind of suspicious email or text sent to you -- if something seems off, it probably is. Never click on dodgy links, and never give away personal information over email. Last and most importantly, always use a VPN on public Wi-Fi networks. It's better to be safe than sorry, and there's no better time to live by those words then when you're using unsecure Wi-Fi. CHRIS: What does Strong VPN do to ensure the privacy and/or anonymity of its customers? DOUG: Our zero-log policy is a core part of who we are, and we take it seriously. Since we own our infrastructure of global servers, we don't allow any third-party meddling with our users' activity. Not only do we never keep logs, but we also provide shared IPs. This aspect of our service ensures that a user cannot be matched to a single IP, making them even more private, untraceable, and secure. CHRIS: What makes StrongVPN a great choice for consumers? DOUG: Compared to other VPNs, our connection speeds are unmatched. We've built an optimized network that makes us one of the fastest VPNs in the world, and our new 'Best Available Location' feature allows users to connect to the fastest server based on their location. We're also proud to be one of the few VPNs to have a zero-log policy. We promise to never track, spy on, or store any of our customers' data. CHRIS: Your best piece of advice for us? DOUG: If you want to keep your online data private, using a VPN is absolutely essential. Of course, I'd say StrongVPN is your best choice. What is a incognito mode?